Silver Lotto System - Silver Or Fools Gold? Is the Silver Lotto System Silver, or just a fools gold lottery wheeling system that has been around for years surviving on hype! We want to explain to you the truth about Ken Silver and his Silver Lotto system that he claims has helped millions to win the lottery. Ken Silver says in his articles the Silver Lotto System will increase your chances of winning by thousands of times. It is stated on Ken Silver’s website that the Silver Lotto wheeling system which comes in a 52 page ebook, will give you a huge 98 percent win rate. Ken Silver even gives you tons of winners testimonials from using his Silver Lotto system and shows you some winning lottery tickets he says he won with his own system that made him a millionaire, hence the nick name Million Dollar Lotto Man. Guarantee, I do not guarantee the members of the Winner’s Circle/ Lotto 80 wins or winnings at any stage. Lotto is a game of pure chance and all I can do is make my reasoned attempts to reduces your losses. My expertise and inside knowledge is no guarantee that your investment will do any better than normal. So now Ken Silver play a different tune to his guaranteed 98% win rate for the Silver Lotto System, why is there no statement of no guarantee for that system which is part of his lottery system group, it makes no sense at all. Silver Lotto System is a very basic type UN-Proven lottery wheeling system. Silver Lotto Systems claimed 98% win rate is pure nonsense! System has NO real lottery winners (NO PROOF). Ken Silver is not a lottery expert at all, just a publisher/marketer. Ken Silver has been reported by many review sites as UN-Trustworthy Seller. System Testimonials have been found to be fake. All good reviews on the system are by actual promoters of the system, selling it for commission, which can fool many people into thinking the system is very good when it is not! Silver Lotto System when tested by many people, routinely failed to produce winning results (No 98% win rate not even 2% win rate). Now let me ask you this, if the Silver Lotto System was really as good of a lottery winning system as Ken Silver claims it to be, why would there be no people of the millions of winners using the system place there vote for the system? Seriously, this Silver Lotto System is a JOKE! With all the real facts pointing out the system and Ken Silver as Un-Trustworthy, you would have to be very silly to even think about buying this silly made-up system. 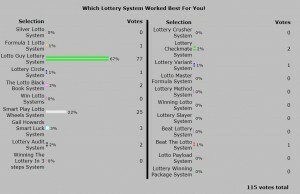 You seen the poll results, the best winning system 67% voted as a real winning lottery system was the Lotto Guy Lottery System. If you know anything about this system, you will know there are many verified lottery winners who use and recommend it. The next systems that are still much better than the Silver Lotto system are Smart Play Lotto Wheels (one of or favorites) then Smart Luck. All you need to do to get real lottery winning results is to use one of these best winning systems. You now know the real truth behind Ken Silver and his not so great after all, Silver Lotto System. Good Luck and lets get out there and win some lottery money will ya! This entry was posted in Lottery and tagged ken silver, ken silver lottery systems, ken silver lotto, ken silver lotto system, lotto-80, silver lotto, silver lotto review, silver lotto system by Lotto. Bookmark the permalink. I did not realize just how much “Hot Air” these systems such as Ken Silver,s Silver Lotto really are until I read your report. I knew this Silver Lotto was exaggerating it,s big lotto winning claims as the proof he shows shows nothing, he says he won 2.7 million, where,s the winning ticket with his named signed up close for all to see? He is lying through his teeth to make money off of peoples dreams to win lotto.